This is a guest post with some free online dog training advice for beginners. When training dogs it is important to be consistent in behaviour and commands used, if the response to whatever the animal does is always different, it will be confused. To reinforce the commands use tone of voice, audible devices, treats and praise, this will have various effects. • By firmly saying ‘sit’ while training the dog to sit and reinforcing that with a treat when he does sit, he will soon come to realise that it makes sense for him to do as he’s told. • The use of an audible device such as a clicker or a whistle will also aid training as the dog becomes conditioned to their use. There is so much that a dog can be trained to do, but there are several basic things that are very necessary and are usually taught in conjunction with one another. Unless a dog is trained to walk properly while on a lead, it can be a real chore to walk the dog. There’s no doubt that it’s a pleasure to walk a dog that doesn’t always pull and training a dog to do this, is not too difficult. Use a quality, strong lead that is comfortable to hold and suited to the dog. Devices such as halter collars and muzzles can also be used; it really depends on the dog. When the dog begins to pull while walking, suddenly stop and firmly use the word ‘heel’ or ‘no’, repositioning the dog at your side. This will serve to reinforce the command and the dog should soon respond to the commands. Be consistent and patient during this training, it will pay great dividends in the end. 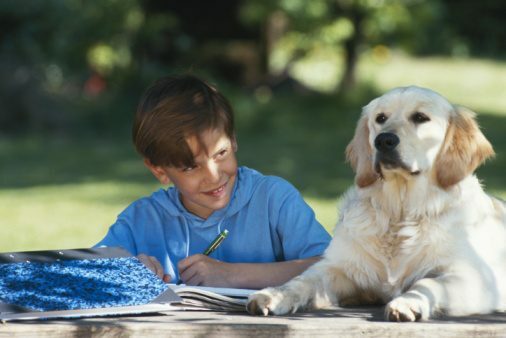 House training is also very important and should be started early on; always encourage the dog to relieve himself outside but expect occasional accidents. Again the use of praise and phrases, such as ‘be quick’ while the dog is relieving himself, will soon become recognised and have the desired effect. A new, exciting and effective method of training is clicker training. Whether you have a new puppy, a behavioural problem or you just want to teach an old dog some new tricks, clicker training is very effective. The clicker is used to tell the dog the precise moment his behaviour is good and the dog soon becomes accustomed to the fact, using the click and treat method. So whichever methods you use, have patience but be firm, be consistent but show you care. How can I stop my border collie from jumping. I have a jumping dog. He has now located the dining room celing light and jumps up , if possible all day. Hi. We have a one year old puppy. He loves to play and is very active. The only bad thing is that, while we are gone at school and my mom is at work he seems to get into trouble. He jumps up on the table, he has ate one of my sisters pills, he has chewed shoes and he has even got in the garbage. Do you have any tips?